Improve employee health, increase engagement, maximize productivity, and optimize performance. Get your employees excited and motivated to take charge of their health so that they can thrive both personally and professionally. Each presentation delivers science-backed research translated into practical bites that your employees can easily digest and immediately put into practice! Topics include but are not limited to: Stress management, healthy snacking, nutrition label reading, healthy worksite habits, nutrition for brainpower foods, energizing eats, and much more. Health Investment: Please contact me directly for more information on pricing and payment plans. Pay it Forward: Learn how participating in our Corporate Wellness program will benefit a local cause through our Bite for a Cause initiative. 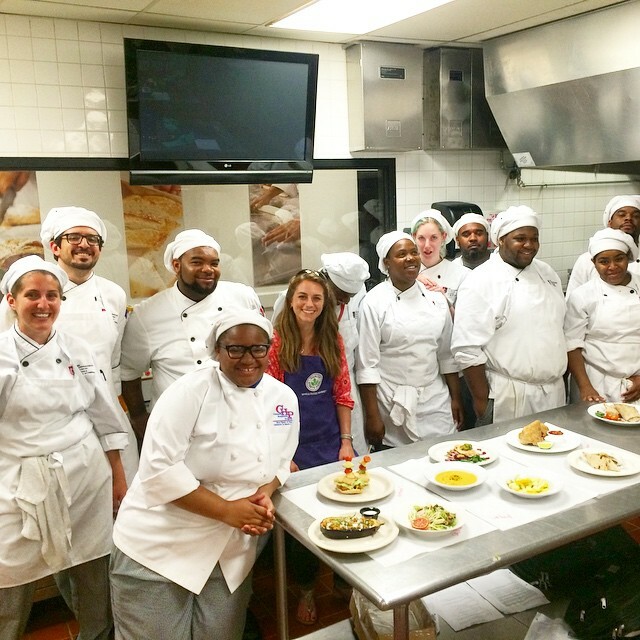 Reward your employees with a fun-filled, hands-on nutrition cooking workshop. Work together, or if you're feeling competitive, split into teams and let the competition begin. Your employees will how to prepare energizing, nourishing meals using efficient cooking techniques, stealthy ingredient swaps and healthy meal prepping strategies that maximize time, flavor, and nutrition. This interactive workshop is the perfect opportunity for your team to enjoy a break from the daily grind while learning new skills that they can bring home to their family. This educational wellness workshop is guaranteed to spark a healthy change and boost employee morale. Health Investment: Please contact me directly for more information on pricing, venues, and menus. Pay it Forward: Learn how your Team Build will benefit a local cause through our Bite for a Cause initiative. Transformation Celebration: Show & Tell your transformation to your coworkers, managers, friends and family over healthy eats! Pay it Forward: Learn how your employee's health transformation will benefit a local cause through our Bite for a Cause initiative.